RBNY vs TFC: Can We Play You Every Week? 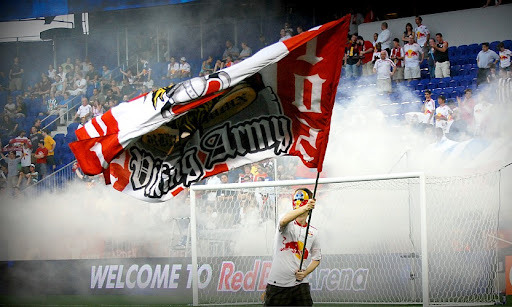 This is a game that the Red Bulls, and their supporters, really needed. After a very dissapointing 4 game road trip, our team really, really needed to take its frustrations out on MLS punching bag Toronto FC. And that's exactly what happened, to the tune of a 5-0 thrashing of the Canadian side. That several key TFC players were injured, and their newly signed DP's could not take part in this one, was of no concern to RBNY. No mercy was shown. Thierry Henry scored the first, followed by a wonder goal from the just returned Luke, Luke, Luke Rodgers. A seemingly legitimate Joel Lindpere goal was controversially called back just before the end of the first half and RBNY went into the break in unfamiliar territory - up 2-0. But you know what they say about being up 2-0. Lots of team have been up 2-0 and have lost, with the USMNT being the most recent example of this phenomenon (in the Gold Cup final, against Mexico). Could the Red Bulls hold on? Well, I need not have worried as Joel Lindpere's and Juan Agudelo's second half goals put the game out of TFC's reach. A terrific performance by several Red Bulls players, most notably TH14, Luke, Luke, Luke Rodgers and Viking Warrior Jan Gunnar Solli. Dax McCarty showed why he was coveted, since last year, by the Soler/Backe braintrust and substitute Juan Agudelo, with a brace, showed the form that's taken him from the RBNY U18's to the USMNT in less than a year. 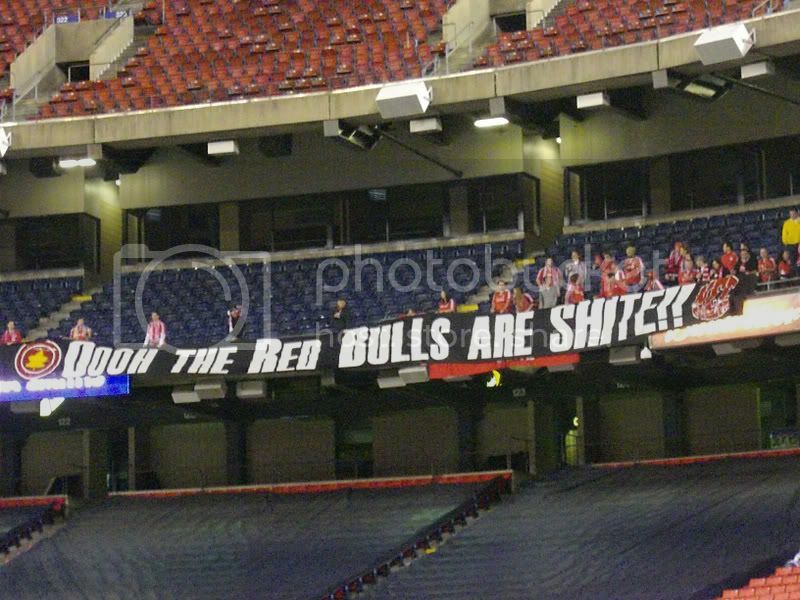 So, are the dominant Red Bulls finally back? We shall see this Saturday when they take on The Forces of Darkness (DC United) @The Cathedral of Football. Please click on the video above for Part I of our usual drunken comments and predictions. You can click here for Part II. Please click here for my photo album from this one, or you can click here for the slide show. 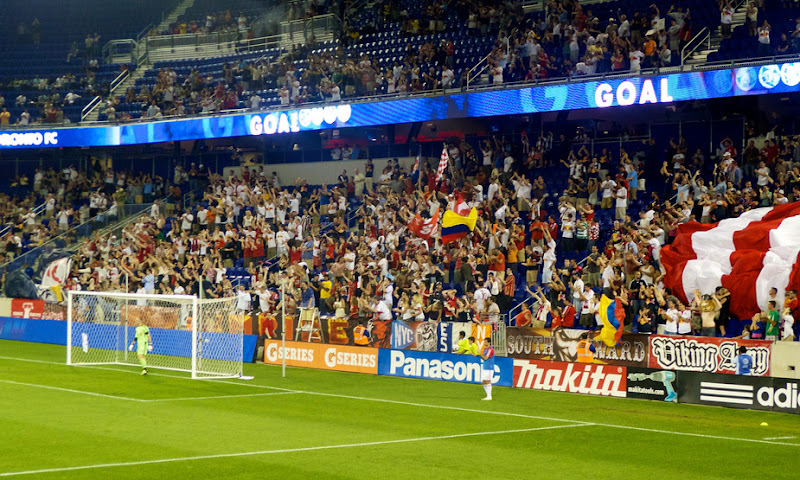 You can click here for a nice photo album from the official RBNY site. A fantastic time, with the usual crew, in the South Ward. The Supporters were in fine form and the tifos were unfurled many times, thanks to the five goals scored. I was a bit disappointed at the lack of TFC support. I was really looking forward to one of their creative banners this year. If you haven't already gotten your tickets to Saturday's game, I would suggest you do it now as a reported 20,000 have already been sold. The Cathedral of Football will surely be rocking, so don't miss out. That's all for now. Viper Out!